Want to know one of the most common questions I get from clients who are considering a Disney cruise? Will my child’s favorite character be on board? How does it compare to the parks? Is it difficult to meet them all? 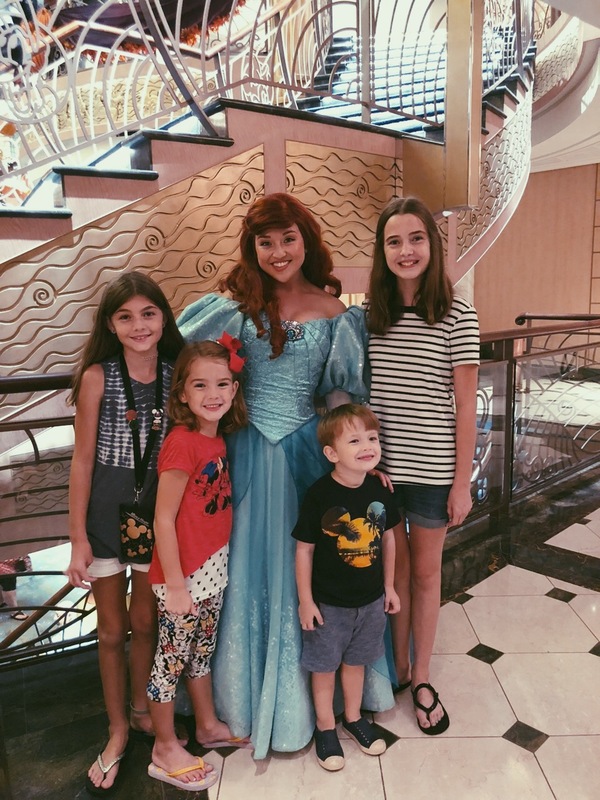 Having just sailed with my family on Disney Cruise Line (7 nights, Eastern Caribbean aboard the Fantasy) I can answer that you will absolutely not be disappointed with your character experience aboard the ship! As you would expect, on a ship headed by Captain Mickey, the main decks are populated by his friends from just after breakfast until late in the evening. There are park-like meet and greets scheduled and posted daily in the event Navigator, but you will find surprise appearances literally around every corner from day one until the farewell show late on your last night aboard. I do not recall a single walk through the atrium without seeing a Disney friend waving from the balcony or running across the main floor with a group of smiling kids. While the characters in these unscheduled encounters are happy to pose for pictures and autographs, they control the crowds by staying in constant motion, waving and interacting from place to place. One of my best Disney memories occurred aboard the ship in a chance encounter between my 5-year-old and Ariel. “I was just headed down to dance! Do you want to dance with me?” And off she goes, hand in hand with my daughter, down the main staircase to dance for a few minutes with the band playing on the main floor. Or maybe it was the day that I hopped out of the pool with my 3-year-old to head over and see Chip and Dale as they were passing through on the pool deck. As he ran up to them they each grabbed a towel and literally dried him from head to toe before posing for their picture. So, who was aboard? I think it’s safe to say that all but the most obscure favorites are represented in some capacity. The Mickey’s clubhouse gang are a constant presence with a full slate of costumes (pirate, captain, formal, sailor…etc.) Many of the princesses as well. Captain Jack, Stitch, Captain Hook, Peter Pan and Tink, Chip and Dale, the Toy Story crew…they were all there! Special character events are hosted by the Disney Junior stars and Anna and Elsa. And did I mention that there were even special appearances made in the Oceaneer’s Club that my littles were able to see? Timon, Peter Pan, Mickey, Avengers Dr. Strange, and Thor were just a few. Each cruise is different and full of surprises, but I think that it’s safe to say that you can definitely get your character fix! Also, since our cruise was Halloween on the High Seas we were able to meet Jack Skellington and Sally, just an added bonus! Comparing the cruise to the parks, we found the wait times to be shorter and the interactions to be longer and more personal. The interactions are so wonderfully frequent that by the middle of the trip, running into Daisy on the way to get a snack seems normal. By the end of the cruise my 3-year-old really believed that Chip and Dale were his buddies. So how do I rate the character experience on the cruise versus at the parks? In the opinion of my family, the onboard experiences more than measure up. My name is Paige Rains, a wife, mother, and homeschool teacher to my 4 children. Since my first trip to Walt Disney World, I have been in love with all things Disney. What I love about Disney is that no matter if it is your first visit or your most recent visit there is always something new and magical to discover. No matter your age Disney has something to offer! My trips as a single adult and alone with my husband were most certainly magical. There is also just no way to adequately describe experiencing the parks through your children’s eyes at different ages.